We last tackled documentaries when we paired Religulous and Going Clear. 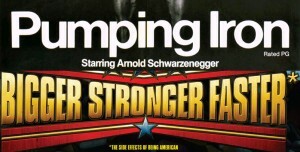 We return to the documentary well with Pumping Iron, the documentary that brought bodybuilding into public consciousness, and Bigger Stronger Faster*, which looks critically at steroid usage in American culture. We’re joined this week by special guest Bill Stiteler! Bill is part of no less than three podcasts: Movie Date with Bill, The Birdchick Podcast, and Brandi and Bill talk about Blaxploitation. Up next, we dip back into our listener suggestions!